On a recent trip to Washington, DC, I visited the International Spy Museum. The tremendous collection of artifacts housed there (such as this shoe with a heel transmitter used by the Romanian Secret Service) brought back memories of Get Smart, one of my favorite TV series of all time. The classic spy spoof lasted for 138 episodes from September 1965 through May 1970. The first four seasons aired on NBC on Saturday night while CBS carried the final season on Friday night. The show then experienced a lengthy run in syndication. 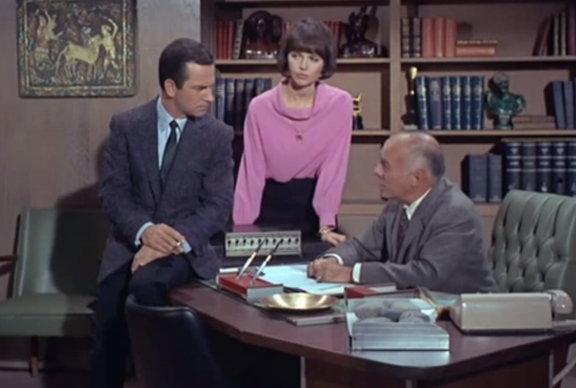 The Get Smart pilot was filmed in black & white, but all subsequent episodes were in color. Mel Brooks and Buck Henry created the TV series which parodied the James Bond movies. The sitcom was set in the nation's capital and featured a trio of lead characters who worked for a secret espionage organization known as CONTROL. Don Adams starred as Maxwell Smart - CONTROL Agent 86. Adams was brilliant in the role of a clumsy, dimwitted, and seemingly incompetent spy. Despite his numerous flaws, Smart was considered the top agent for CONTROL. Adams had a very distinctive vocal delivery which was ideal for playing Agent 86. He had previously been the voice of penguin Tennessee Tuxedo in a Saturday morning cartoon series. Adams was a former comedian and many of the Maxwell Smart antics and the classic "Would you believe?" sequences actually originated from his old stand-up routines. His mannerisms and wealth of one-liners put a stamp on Get Smart. Barbara Feldon portrayed CONTROL Agent 99. Her character was never identified on the series by name and simply went by the moniker "99". In stark contrast to the bumbling Max, Agent 99 demonstrated intelligence, poise, and style. Feldon's low-key demeanor was perfectly suited for that role. During scenes involving Max and 99, Feldon would often lean or slouch to avoid drawing attention to the fact that she was taller than Adams. Her character married Max during season 4 and gave birth to twins in season 5. In the 1960s, it was rather rare to see a lead "career woman" on a TV series. According to Feldon, many female fans told her that they viewed Agent 99 as a role model. Edward Platt played the Chief of CONTROL. No matter how badly Smart would bungle things, the Chief always trusted him with the most important assignments. Whenever Max made an inane remark, the stares and exasperated facial expressions by the Chief were priceless. Both the Chief and 99 were splendid in playing a "straight man" role to Max. The characters played by this trio on Get Smart were clearly the signature marks of their respective acting careers. The show was memorable for the various spy gadgets used by the agents. On many episodes, Max and 99 would visit the CONTROL lab to obtain special weapons and equipment for their assignment. Max's apartment was also set up with various gizmos such as an invisible wall and a net which drops from the ceiling. Obviously, the most famous gadget was Max's shoe phone which rings during the first scene of the pilot episode Mr. Big. Max would take off his shoe to make or receive a call with the Chief. Agent 99 used various phone gadgets including a comb and compact mirror. I find it fascinating to see the frequent usage of "mobile" phone devices on the 1960s Get Smart TV series in light of the modern cell phone. My favorite gadget was the Cone of Silence. If the Chief was about to discuss top secret information, Max would claim that CONTROL regulations required them to use the Cone of Silence. The Cone was a clear plastic contraption which lowered from the ceiling of the Chief's office and covered their heads. As an aside, the name of the device seems curious as it was not in the shape of a cone. Of course the running gag was that the device never worked properly. The Chief and Max would have trouble hearing each other and would start yelling or leaning outside the Cone. Like the shoe phone, the Cone also debuted in the pilot episode. The writers creatively incorporated different failures of the Cone into various episodes. On one show, Max and the Chief resorted to using a set of cards called the CONTROL Secret Word File while still under the Cone. 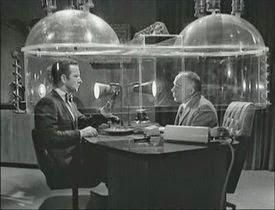 Another episode featured a portable Cone of Silence. In a typical episode, the Chief would assign Smart and 99 to investigate and thwart a devious plan from KAOS, the so-called international organization of evil. The CONTROL agents would inevitably find themselves in a precarious position in the clutches of KAOS. Fortunately, some quick thinking by 99 or an occasional brilliant (or lucky) maneuver by Max would save the day for CONTROL - often assisted by the ineptitude of the KAOS agents. The series featured a set of villains who made repeat performances. The most prominent of these was KAOS agent Siegfried who was played by Bernie Kopell using a thick German accent. The interplay between Smart and the recurring villains is classic as they seemed to treat each other as friendly rivals rather than arch enemies. The plots incorporated other secret agents in minor roles. David Ketchum played CONTROL Agent 13 on several episodes where he would be stationed in a bizarre hiding location such as a vending machine, mailbox, garbage bin, ice machine, or airport locker. An iconic feature of Get Smart was the show opening sequence and theme music. Max enters a building and walks down a hallway as an elaborate set of doors open and close until he enters a phone booth and then disappears from view. During the closing credits, he walks through the same doors in the opposite direction before the doors start closing in rapid fashion. "The old < ... > trick"
"I hope I wasn't out of line with that crack about < ... >"
In The Last One In Is A Rotten Spy, Max has a cover assignment as an American swim team trainer. This episode contains an awesome scene from 0:45-4:00 where Smart unsuccessfully attempts to record a phone conversation and then searches for a pencil ("Two drawers and only one shot left"). It also features a memorable "Would You Believe?" sequence at 6:20. The scene starting at 7:40 demonstrates a classic Smart delay tactic which is capped off by the Chief screaming "Get in the pool!". There is a "Sorry about that Chief" at 10:16 and an example of "And loving it" at 13:11. I Shot 86 Today uses a golf course story line (and a double entendre title). At 8:20, Smart receives his special equipment from the lab complete with a golf shoe phone. Max predictably spikes himself in the face while using it at 17:30. Max spots "the old <mortar in the rocks on the 14th hole> trick" at 20:03. I get a kick out of the sidebar moment at 21:10 where a golfer patiently waits for the cart chase with gunfire to pass through before playing his stroke from the fairway. While not a sports-related episode, A Spy for a Spy includes an epic scene at 18:22 where Smart and Siegfried negotiate trades of kidnapped CONTROL and KAOS agents like a pair of professional sports team general managers. Siegfried, who was making his first appearance on the series, utters what would become one of his classic recurring lines "We don't shush here" at 7:30. The banter between Smart and Siegfried highlights this episode, especially the weapon check scene starting at 8:00. This episode also contains an example of the phrase "I hope I wasn't out of line with that crack about <Fathead>" at 15:53. Get Smart won a total of seven Emmy Awards including two for Outstanding Comedy Series. Adams received the Outstanding Actor in a Comedy Series honor three times while Feldon was among the nominees for Outstanding Actress twice. 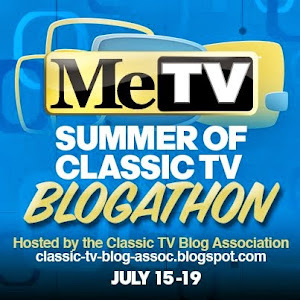 This post is part of the Summer of MeTV Classic TV Blogathon hosted by the Classic TV Blog Association. Please check out the complete schedule of blog posts for this event. 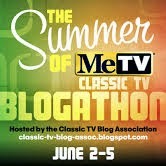 Thanks for inspiring me to catch this series again on MeTV. I've always loved how the agents for KAOS and CONTROL often treat each other as mere industry rivals, often discussing union issues, health benefits, bonuses, etc. What a classic! Great review--thanks for writing this. Thanks, Joanna. Yes, the dynamic between the sets of agents was fascinating. I remember the fight scene in the hospital the day the twins were born. When a nurse announced that Max was a father, the KAOS agents paused the fight to congratulate Max and then resumed the fisticuffs. 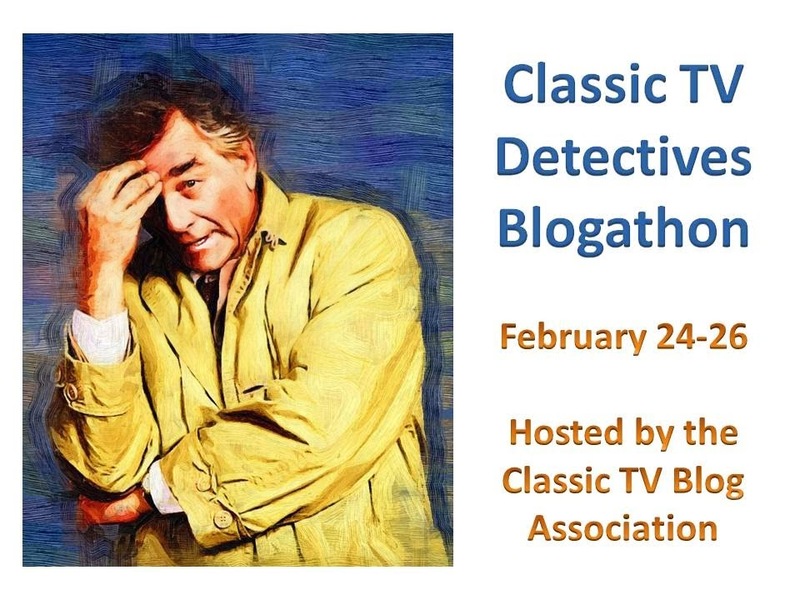 I've learned so much from this blogathon. I didn't know that many of Max's classic lines originated Don Adams' stand-up act. My fave was always: "Missed it by this much!" I also adored Bernie Kopell as Max's KAOS adversary; I think that's when the series really took off for me. Bernie is so different from the doctor he would later play on THE LOVE BOAT. Finally, I have to mention my favorite GET SMART episode: It's a spoof of THE PRISONER OF ZENDA with Don Adams doing a fine Ronald Colman voice impersonation. Thanks, RIck. I also learned some things during my research for this post. Yes, interesting to see Kopell in such different roles - been a long time since I've seen a Love Boat episode, so I should try to seek one out. 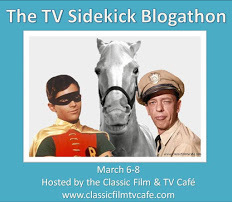 And thanks for hosting the blogathon. The best episodes featured Siegfried vs Smart, since both characters were inept in their own ways. Curiously, Siegfried was higher up the KAOS chain of command than Smart was at CONTROL, proving the Peter Principle "you rise to your level of incompetence"
BTW, Did you know neither KAOS nor CONTROL were acronyms that stood for anything (like United Network Command for Law and Enforcement = U.N.C.L.E.)? Thanks, Britt. I agree on the Siegfried episodes. Yes, I knew the bit about the non-acronyms and had considered working that into the post, but my writeup seemed a bit long already. Thanks for the article on Get Smart. What a clever and funny show! As a fan of James Bond films it's particularly funny to watch Get Smart. And I have to admit that I like to check out the clothes in the show, 1960s fashion. Will definitely be watching again. Thanks for the words. Agent 99 wore a number of stylish outfits on the show. I'm also a big fan of Mad Men and find the 1960s fashion quite interesting. Thanks, Amy. I agree that is an awesome exchange - there are so many of them on this series. Great post! I loved Get Smart when I was a kid both because it's hilarious, but also because my parents and I would watch it together. This brought back some fond memories. Thank you. Thanks, Amanda. I remember watching the syndicated reruns with my brothers after school and we adopted many of the one-liners. What a super show! You missed it by that much... Sorry about that Chief, I just had to use those phrases. You missed the Sunbeam Tiger and double Alpine, Opal GT, Karmann Ghia, and the Chief's 68 Shelby convertible. Later and Alpha Romeo Spider Veloce, in Get Smart Again. Why they didn't use the Ferrari 250 GT Cabriolet from the pilot? There was a Citroen which is funny without Don Adams. The Tiger was a spy car, that had a pop up machine gun, ejector seat, and a phone dialer in the steering wheel. The Zebra car, a modified Mustang is in a few scenes.